In our ageing society, falls and their consequences cause tremendous problems as related to fractures, quality of life and health care costs. Due to the ongoing changes in the age structure of the population, this problem with all its consequences will further increase in the near future and innovative and cost effective solutions to avoid falls in community-dwelling older adults are urgently needed. 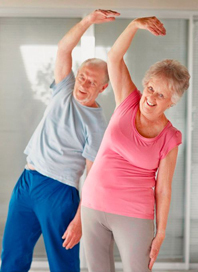 Hereby active prevention plays an important role, especially in terms of fall-specific exercises and training programs. Modern information and communication technologies (ICT) in the field of home-based sensor technology, telemedicine and video games can support appropriate activities excellently as they are motivating and increasingly used by older people living at home. The aim of iStoppFalls is to develop and implement ICT-based technologies which can be easily integrated in daily life practices of older people living at home, and which allow for continuous exercise training, reliable fall risk assessment, and appropriate feed-back mechanisms, based on discreet measuring technologies and adaptive assistance functions. Main objectives of iStoppFalls are to increase the quality of life of our elder citizens and to reduce fall risk, falls and related costs. iStoppFalls will involve representatives of world-leading technology and research experts from both university and industry partners in Europe and Australia. The program will strengthen collaboration between research and technology which will provide tailored solutions for the ageing society, and thus contributes to European competitiveness and excellence. © 2011-2014 iStoppFalls Consortium • The project has received funding from the European Community (grant agreement 287361) and the Australian Government.